Ubisoft wants PC gamers to know it's heard the complaints and anger regarding its DRM "online services platform," and, after careful consideration, it's digging in. The creative side of the company is now calling it vital to what they do. "We consider that protecting our PC games is vital to our business," Max Béland, the creative director of Splinter Cell: Conviction told VG247, "and will allow us to continue investing in the development of creative and innovative games on the PC platform." Yes, argumentatively speaking, the sarcasm in this post would imply that sound business practices, such as protecting the effort put into one's products, don't ensure the ability to make more good products down the line. They do. I just disagree that copy protection requiring an always-on Internet connection is a sound business practice, especially when having that connection is a necessary but not always sufficient condition for playing the game. 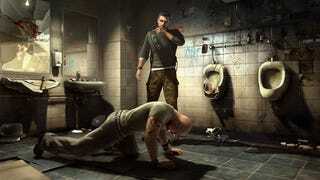 Anyway, PC gamers, Splinter Cell: Conviction won't be out until April 27. So, in addition to the DRM, you get to wait two weeks while everyone plays it DRM free on a console. How's that for not having your cake and not eating it too?